One of the less happy missions I’ve been on with Storykiosk: to help visitors at the Higgins Armory Museum, a beloved cultural institution in Worcester MA since 1931, say goodbye to the museum before it closed forever on December 31. 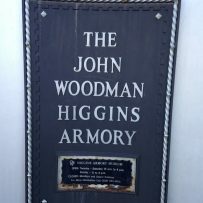 What’s your favorite memory from a visit to the Higgins Armory Museum? Say goodbye to the Museum. What do you want to say? Visitors rose to the challenge. We recorded hundreds of videos in the final two months before closing. Several things struck me as I listened to the stories: there were key objects and experiences that re-appeared throughout the videos — the dog wearing armor, the giant chess game, making a shield, and the experience of the Great Hall itself are a few of the highlights. I was also struck by how articulate most of the 7-10 year old boys were talking about the museum’s collections: knights, armor, and swords. And, finally, what an intergenerational experience the museum provided. There were several older visitors who talked about their memories visiting the museum as a child, and their desire to share the experience with their own children and grandchildren. Great that the collection is going to the Worcester Art Museum, though of course a museum is much more than its collections — including the staff, programs, and the building itself. A difficult situation all around, but one that concluded with the integrity of the collections and heartfelt appreciation from the community.